CBS13 television station based in Alabama today ran the news story about Blessed Seelos's 2 nd miracle which is under investigation by the Baltimore Archdiocese. St Mary's Church Annapolis was where Blessed Francis Xavier Seelos served as pastor in 1857 & 1862-1863.Within the Church are two windows,the first dedicated to St John Neumann and the other to Blessed Seelos.At the beginning of the year 2009 plaques were added below both windows.This initiative to spread the news about Blessed Seelos and his connection with the church was partly brought about by the visit of Robert L Worden & his wife to Füssen in 2007. VICAR GENERAL PASSES OUR NEWS ITEM ABOVE TO THE GERMAN MEDIA! The Vicar General of the Diocese of Augsburg,Pralet Karlheinz Knebel has passed the news item above to the German Media.He told us," I have passed your information to those responsible for the Diocesan Sunday Paper and the other media".Lets pray that here in Germany many will know be interested in the "Son of Füssen" who gave his life working to bring the faith to those German-Americans who were so poorly spiritually nourished at the time. You could be forgiven for not knowing that a second miracle connected to Blessed Francis Xavier Seelos is currently being investigated!That is if you live in Germany.Whilst the US media is full of the news on TV,Radio Stations and in the Press here in Germany the weekly Diocesan Newspaper for Augsburg -Katholische Sonntags Zeitung fur Bistrum Augsburg has completely ignored it.They were even sent the news release about it but did not find it at all important. 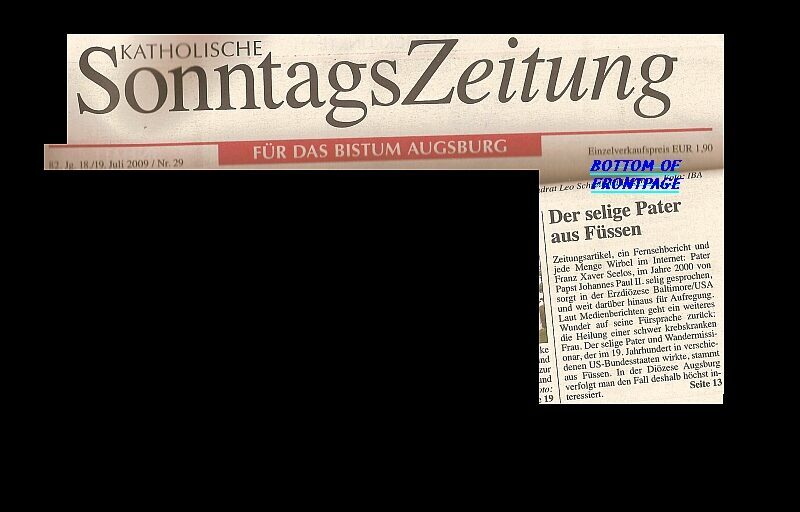 A priest born in Füssen,Germany within the Diocese of Augsburg-NOT NEWSWORTHY! Blogs and News sites have been quick to pick up on the article you can visit them below.The Associated Press also syndicated a news release. its residents every 10 years. Cologne-Rudesheim on a scenic Rhine Cruise. Is St Mang's a church where we can have Mass and is that basilica actually in Fussen? led by the Provincial of Denver Redemptorists,Fr Tom P. C.Ss.R. We hope very soon to make a few videos showing the places in Füssen associated with Blessed Francis Xavier Seelos.The videos will include the house where he was born from the outside.The house he moved to when his father became sacristan of St Mang Basilica.St Mang Basilica itself where he was Baptised,Made his 1st communion,his Confirmation and served in.Also the Krippkirche where he sevred Mass each day before going to school.We will also show the building which was his school and the small chapel in Eschach just outside Füssen which has a relic of the Blessed in the Altar.He had a great love for our Lady and the Frau am Berg Kirche(Our Lady of the Mountain Church so we will be also videoing that.We will also video the cemetary where his family are buried.We hope to get permission from our Parish Priest Father Frank Deuring to go ahead with these projects ion both English and German language versions.We have been wanting to do this for the past two years but due to financial constrants have never got round to doing it.We have launched a test video on 26th May 2009.This is only a test and is made using a child's toy video camera.We hope to purchase a new video camera and do a much better job. We welcome suggestions of other places to film at connected with his life please use the contact form to tell us. Go home and prepare to die. That’s what Mary Ellen Heibel’s doctors at Walter Reed Army Medical Center in Washington told her May 11, 2004, after they discovered that the cancer that had attacked Heibel’s esophagus in 2003 and then a lymph node later that year had spread throughout her body. Given about six months, the longtime parishioner of St. Mary in Annapolis underwent a new form of chemotherapy at The Johns Hopkins Hospital in Baltimore as a palliative treatment to extend her life. But doctors warned it would only postpone the inevitable. At the suggestion of a Pittsburgh priest, Heibel began praying a novena in 2005 to Blessed Francis X. Seelos – a 19th-century Redemptorist pastor of her parish who died of yellow fever in 1867 in New Orleans. One week after she began the novena at her parish, Heibel’s cancer disappeared. Gone were tumors in both lungs, her liver, back and sternum. When Dr. Michael Gibson, her doctor at Hopkins, called with the news, Heibel couldn’t believe it. Told by her doctors that the unexplained healing could not be the result of her chemotherapy, Heibel is convinced that Blessed Seelos interceded on her behalf. “I know this had to be a miracle,” she said. Archdiocesan officials are now investigating whether Heibel might just be right. Archbishop Edwin F. O’Brien opened an archdiocesan inquiry into the alleged healing with a May 19 Mass at the Basilica of the National Shrine of the Assumption of the Blessed Virgin Mary in Baltimore. The archbishop also appointed a group to investigate the case and listen to testimony from Heibel, Dr. Gibson and other witnesses. The commission’s findings will be sent to Father Antonio Marrazzo, Redemptorist postulator general in Rome, who will then take them to the Vatican’s Congregation of the Causes of Saints. 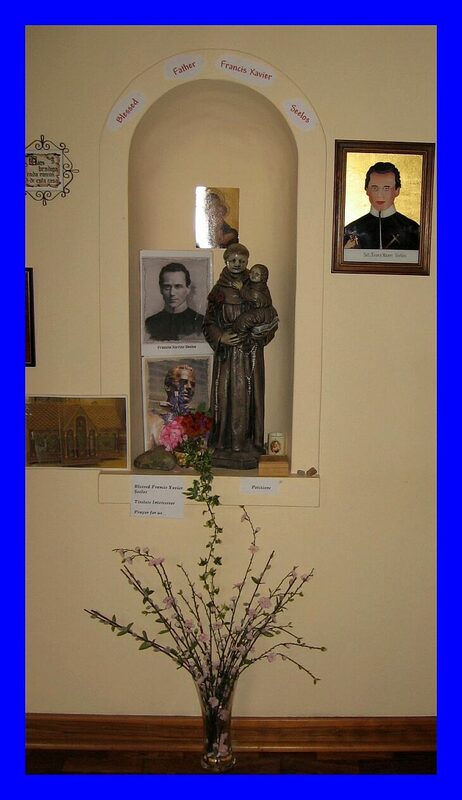 If the healing is deemed miraculous, Blessed Seelos could be canonized by Pope Benedict XVI. Cardinal William H. Keeler was also at the Mass. Father Gilbert Seitz, the archbishop’s episcopal delegate in the inquiry, said members of the investigative group include Dr. Larry Fitzpatrick of Mercy Medical Center in Baltimore, who will serve as a medical expert; Capuchin Franciscan Father William Graham, promoter of justice; and Deacon Neil Crisp and Leslie Engle, notaries. Redemptorist Father John Kingsbury, pastor of St. Mary, said the possible healing is a “major breakthrough” in the canonization effort. 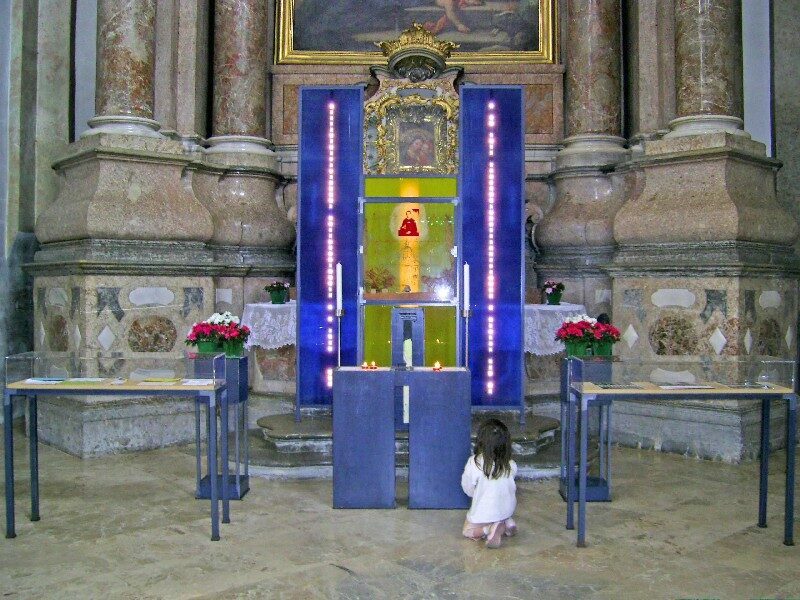 Two miracles that occur after death are needed to become a saint in the Catholic Church. 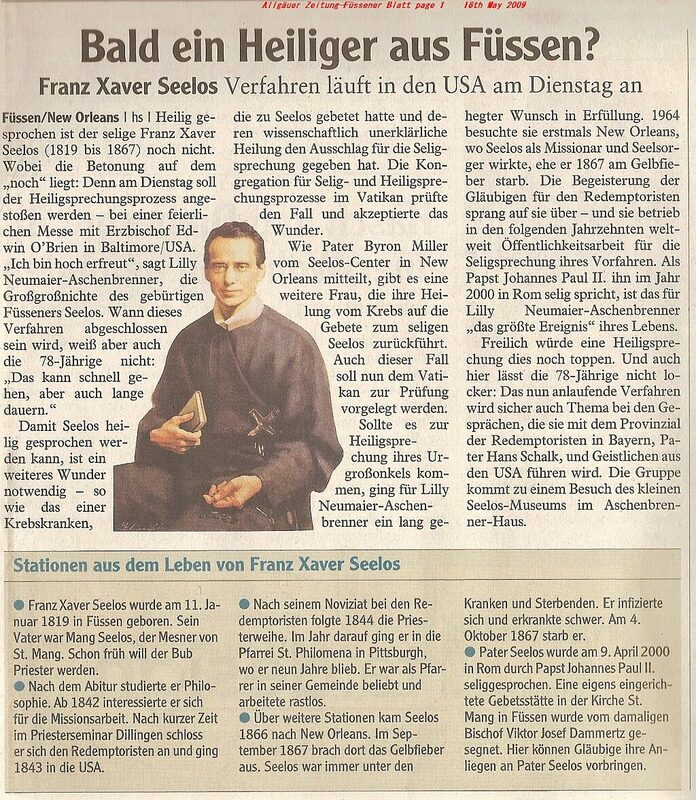 The first for Blessed Seelos was recognized when Pope John Paul II beatified the German Redemptorist in 2000. The second miracle needed for canonization could be the Heibel case. 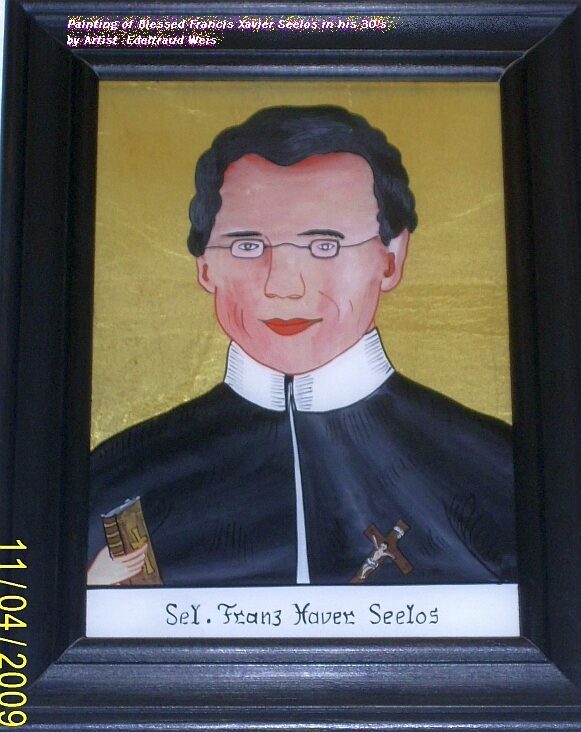 Born in 1819 in Bavaria, Blessed Seelos came to the United States in 1843 to minister to German-speaking immigrants. Ordained at the now-closed St. James parish in Baltimore in 1844, Blessed Seelos ministered in Pittsburgh before being assigned pastor of St. Alphonsus in Baltimore in 1854. While at St. Alphonsus, Blessed Seelos also ministered at St. James and St. Michael in Baltimore. He laid the cornerstone for St. Joseph in Fullerton. Blessed Seelos became pastor of St. Mary in Annapolis and novice master for Redemptorist seminarians in 1857, and two months later he became pastor of Ss. Peter and Paul in Cumberland and director of the Redemptorist seminary at the parish. During the Civil War, Blessed Seelos relocated his seminarians to Annapolis in 1862 and again became pastor of St. Mary. He visited President Abraham Lincoln in an effort to exempt seminarians from the draft. Because only priests could be exempt, Blessed Seelos arranged for Archbishop Francis Patrick Kenrick to ordain all 20 seminarians. Blessed Seelos worked in Detroit in 1865 and then was reassigned to New Orleans a year later, where he ministered for 13 months before dying at age 48 after ministering to victims of the yellow fever outbreak. Sitting on a bench next to a seated bronze statue of Blessed Seelos at St. Mary a few days before the archdiocese opened the investigation into her alleged healing, Heibel said she attends Mass, prays the rosary and prays to Blessed Seelos every day. She wears a relic, a chip of Blessed Seelos’ bone, around her neck. Many parishioners have been praying for her throughout her ordeal with cancer. “I think people were shocked when I was dying practically and came back to life so fast,” said Heibel, who retired last year as a self-employed antiques appraiser. Heibel said her strong faith is what’s sustained her through numerous health challenges in her life – including a kidney transplant, poor hearing and a bout with septic shock. “Every time I got sick, my faith increased,” she said. Heibel noted that other parishioners and other believers around the country have reported miracles through the intercession of Blessed Seelos. Prelate Karlheinz Knebel,Vicar General of the Diocese of Augsburg is to take Blessed Francis Xavier Seelos and Rainer Wagner,both priests of the Diocese of Augsburg as his personal example during the Year of the Priest which starts on 19th June 2009. 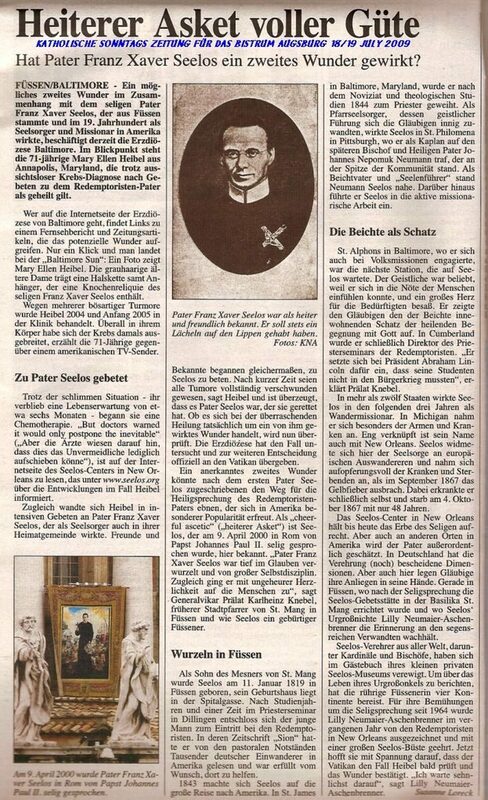 Having sent a copy of the information to the local paper in Füssen.the Allgäuer Zeitung two weeks ago,It was amazing to see that due to the great neice of Blessed Seelos,Lilly Neumaier-Aschenbrenner they finnally printed the info on the 16th May 2009.Below is what they reported. At least 20-30 C.Ss.R. priests are concelebrating the above mentioned Mass with Archbishop Edwin F. O'Brien of Baltimore,according to the the Administrator of the National Seelos Shrine in New Orleans,Joyce Bourgeois. It is with great delight and glory to God, that Most Reverend Edwin F. O’Brien, Archbishop of Baltimore, has confirmed the date of May 19, 2009, to proceed with the official diocesan Inquiry Phase of the Canonization Cause of Blessed Francis Xavier Seelos, C.Ss.R. At that time, a special Opening Mass at 12:10 p.m. will be held in the historic Basilica of the Baltimore Archdiocese (409 Cathedral Street, Baltimore MD 21201). 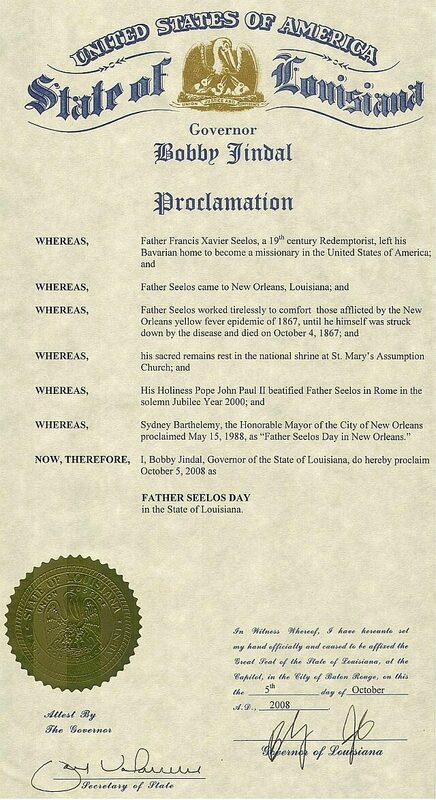 Concelebrants are asked to bring an alb and white stole and confirm their attendance by leaving a message with the Seelos Center at 504-525-2495 or 504-525-2499 no later than May 17th. After the Mass, Rev. Gilbert J. Seitz, J.C.L. of the Baltimore Archdiocese Metropolitan Tribunal will begin the depositions of key witnesses – including that of Mary Ellen Heibel of St. Mary’s (Redemptorist) Church, Annapolis, who attributes her healing of metastasized esophageal cancer through Father Seelos’ intercession. After the Session(s) of the Inquiry Phase are conducted, the official documentation will be sent to the Redemptorist Postulator General, Rev. Antonio Marrazzo, C.Ss.R., for review by the Vatican Congregation of the Causes of the Saints. Let us pray for God’s continued blessings on this exciting advancement in the Seelos Cause! PRESS RELEASE Contact: Fr. Byron Miller, C.Ss.R. permanently enshrined in a sacred reliquary. 1867. He was beatified by His Holiness Pope John Paul II in Rome on April 9, 2000. The second official Pilgrimage from the United States will visit the Seelos Shrine in St Mang Basilica on 24th May 2010.The pilgrimage is being run by CatholicJourneys.com.The Pilgrimage is being led by Father Stan Klores.The Pilgrimage will vist the Holy Shroud in Turin,Italy.Next they travel to France to visit the Marian Shrine of La Salette.This is followed by the Shrine of Notre Dame du Laus.They will then enter Germany and spend a few days in Munich and Regensburg before visiting Markkö am Inn the birth place of Pope Benedict XVI.Then the pilgrimage makes its way to the Marian Shrine of Our Lady of Altötting. 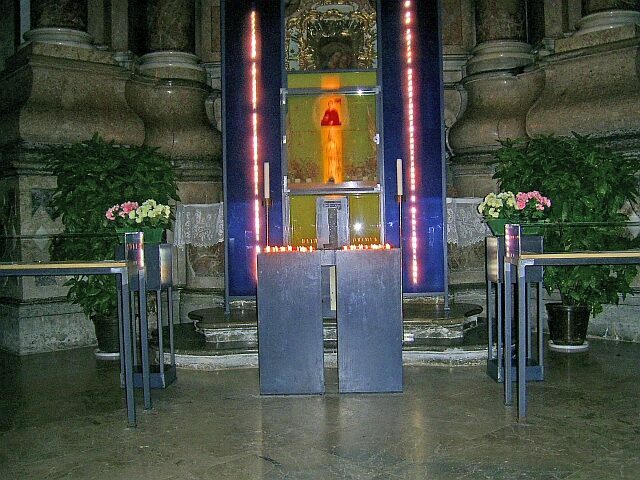 On May 24th 2010 the Pilgrims come to the Shrine of Blessed Francis Xavier Seelos here in Füssen. The Spiritual Director Father Klores will celebrate Mass in the Basilica for the pilgrims.They will then visit the nearby castle of Neuschwanstein and after lunch make their way to the world famous Wieskirche. The final day will be spent watching the Passion Play in Oberammergau. (504) 834-4951 / (800) 715-6670. 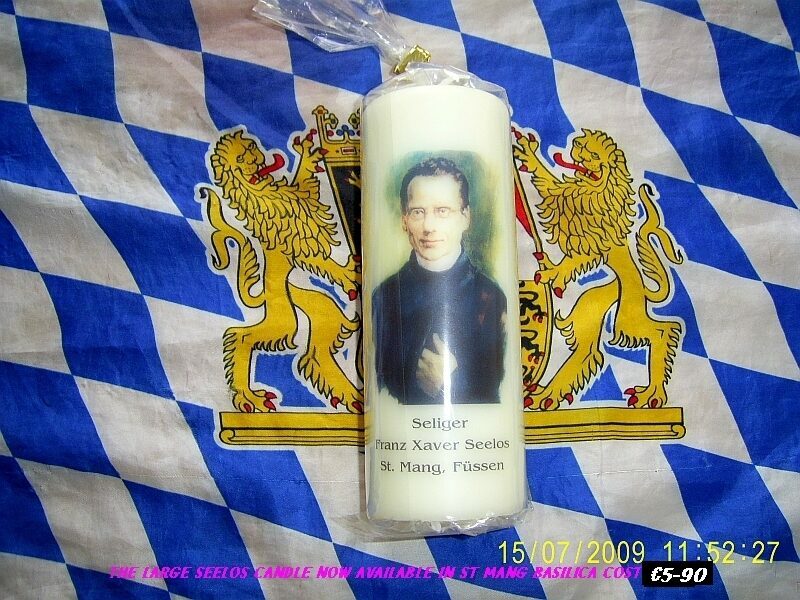 The English website of St Mang Basilica,a private website run by Myke & Dr.Miriam Rosenthal-English has brought it to the attention of the Mayor of Füssen that the official Füssen website make no mention of Blessed Francis Xavior Seelos. Myke Rosenthal-English complained to the Mayor,Paul J. that the official site had nothing about this great son of Füssen on their websites. Mayor J. promised he would look into the matter. Treatment by the town of Füssen where Blessed Seelos was born contrasts greatly with towns and cities in the USA where Blessed Seelos served.The City of New Orleans even has a day dedicated to him!Yet Füssen wants to ignore him.There is no excuse for this as the house where he was born has a plaque on it saying so.There is also a small shrine in St Mang Basilica where pilgrims come to pray to him.The 1st official US pilgrimage to Füssen to celebrate Holy Mass and pray at the shrine as well as learn more about Blessed Seelos took place in 2008. With Füssen claiming to be so publicity conscious it is truly amazing that the local tourist office fails to give any information on the Churches in Füssen on its English speaking website.If you can speak German then they will tell you about the wonderful churches and their history.However with Blessed Seelos likely to be canonised one day and the second miracle under investigation,Füssen puts its head in the ground and ignores the thousands of Americans who regulaly enter Blessed Seelos in a search engine.The one site they can guarentee not to find with info is the OFFICIAL WEBSITE FOR THE TOWN OF FÜSSEN.We pray that Mayor J. will not only investigate but will actually come up with some positive action which will see the town of Füssen finally show visiters more info about this great man of God who was born in their town. Mayor Paul J. has been good to his word and has actually taken the matter further.He even took the time to contact the Vicar general of the Diocese of Augsburg to get more information about how the Canonisation process is going.More info on this as its breaks.With a second miracle being investigated we pray soon that Blessed Seelos will become St Seelos!We will cover news out of New Orleans,Füssen,Augsburg & the Vatican on how the process is moving forward. When our copy of the DVD about Blessed Francis Xavier Seelos entered Wales it impressed a convent of enclosed religious sisters of the Poor Clare Colettine order based in Wales so much that they did this! Interesting that the Poor Clares are of the Franciscan Family and that Blessed Seelos is having to share with St Anthony.Blessed Seelos would have known the Franciscans based in Füssen.The Patron of the Bavarian Province of the order is St Anthony.The sisters were unaware of this information before they made the shrine in their convent.They told us, " really that DVD is not to be missed !!!! They went on to say "the whole community absolutely loved it it was so inspiring, such an example of holiness.... its all in his eyes, the one old photograph used in the film said it all... a man deeply in love with his Lord.OH how much good, how much good and how many lives 1 holy priest can touch !!! "